· This plant belonging to family Podophylaceae grows well in the hilly regions of Sikkim, Uttar Pradesh, Punjab, Himachal Pradesh, and Kashmir. · It is a flowering herb with a creeping root stock with deeply lobed leaves having toothed margins (Fig 10.15). · Flowers are usually solitary, cup-shaped, and white or pink in colour. · Fruits are generally ovoid and bright scarlet. o egative effect on axoplasmic transport. o Inhibition of protein, RNA and DNA synthesis. o Blocking of oxidation enzymes in tricarboxylic acid cycle. 1. Podophyllum and its resin are used as keratolytic agents whose caustic action is thought to be caused by the arrest of mitosis in metaphase. 2. Topical treatment of condyloma acuminata (venereal warts). 3. Podophyllum is also used in Homoeopathy. Ingestion or dermal application could both result in toxicity. The toxicity associated with podophyllum is colchicine-like, arresting cellular mitosis in metaphase. Symptoms generally begin 30 minutes to several hours following ingestion, and 12 to 24 hours after dermal absorption. · Exposure of eyes to podophyllum powder causes intense irritation with conjunctivitis, keratitis, corneal ulceration, and iritis. · Ingestion results in nausea, abdominal pain, vomiting, and diarrhoea, followed by fever, tachypnoea, peripheral neuropathy, tachycardia, hypotension, ataxia, dizziness, lethargy, confusion, and altered sensorium. Seizures may occur. Polyneuropathy generally appears in about a week, and progresses for 2 to 3 months. · After a few days, pancytopenia and hepatic dysfunction may occur, which generally resolves in 2 to 3 weeks. · Cardiotoxicity, ileus, coma, and hallucinations may also occur. · Autonomic dysfunction, including sinus tachycardia, urinary retention, paralytic ileus, and orthostatic hypoten-sion may persist for several months. · Oliguria, anuria, and renal failure are rare complications. 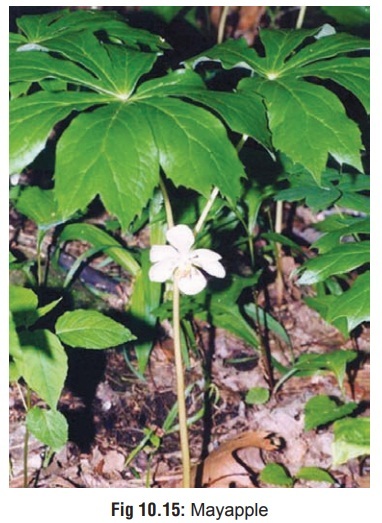 · Consumption of Chinese herbal products containing extracts of podophyllum have caused neuropathies and encephalopathy. · It has been suggested that podophyllum should not be used during pregnancy for the treatment of genital warts due to the potential for severe myelotoxicity and neurotoxicity in the mother. Also, there are indications that podophyllum may be teratogenic and carcinogenic. Squamous cell carcinoma-like changes have been reported following the dermal use of podophyllum in humans. Obtain baseline CBC, haemoglobin, electrolytes, calcium, and renal and liver function tests. · Gastric decontamination: Emesis is not indicated. Activated charcoal can help. · For hypotension: Infuse 10 to 20 ml/kg of isotonic fluid and place in Trendelenburg position. If hypotension persists, administer dopamine or noradrenaline. · Monitor electromyography and nerve conduction velocity in all patients with symptoms of peripheral neuropathy. · Patients generally recover from thrombocytopenia and leukopenia within 1 month. Granulocyte colony-stimulating factor (G-CSF), or filgrastim may be effective in acceler-ating recovery from neutropenia following podophyllum poisoning. · Due to the large molecular weight of the compound it is unlikely that haemodialysis would be effective for removal of podophyllum. Early charcoal or resin haemoperfusion has been suggested by some investigators to be useful in facilitating neurological recovery in some patients. But there is no conclusive evidence regarding its usefulness. In one reported case, postmortem examination revealed partial maturation arrest of granulocytopoesis and a severe decrease in megakaryocytes. There were multiple petechiae on the pleura, the peritoneal surfaces of many organs, and the gastric mucosa. Severe pulmonary congestion was present, as well as marked vascular congestion of the liver and kidneys. There was a small area of focal acute necrotising bronchial pneumonia, and the brain was oedematous.